Nothing is better than getting something cute for free! Abercrombie tees starting at $7. Hollister jeans starting at $12. G-Star Jeans for men and women - starting at $45. Diesel shoes starting at $17.99. True Religion jeans for $45 and up. Authentic Fendi bag, Dooney & Burke bags, and Bebe purses. Prom Dresses! Unique prom dresses that will be great for spring. And just below that, they linked to my blog! So, thanks Uptown Cheapskate. I appreciate the link. They're buying the best of all season right now, and will pay more for high-demand brands like True Religion, 7 For All Mankind, Diesel, G-Star, Daytrip, BKE, Express, Bebe, Hollister, Abercrombie, and Juicy. They offer 30-40% of what they can resell your items for depending on how in-demand the items are. They need more: jeans, shorts, tee-shirts, capris, men's pants, tank tops and shoes. Stop by anytime they are open, and they will pay you cash on the spot for the things they buy. 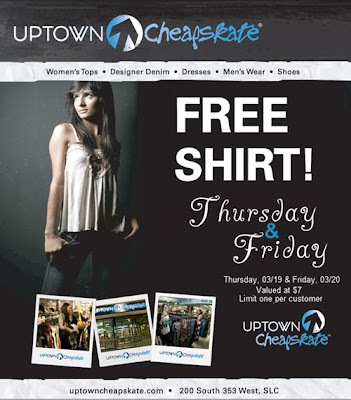 Don't forget your free shirt ($7 value, Thursday and Friday only).